Fifty years ago, in 1925, South America was dedicated for missionary work. From a beginning handful of faithful Saints and devoted missionaries, the Church has established itself solidly and now readies itself for a double area conference: one in São Paulo for the Portuguese-speaking Brazilian Saints, February 28, March 1, and March 2; and the second one in Buenos Aires, Argentina, March 7–9, for the Spanish-speaking Saints of Argentina, Chile, Uruguay, and Paraguay. These five countries count among themselves 16 stakes and ten missions. The statistical report for 1973 shows a membership of 128,554; over 7,000 of these members have been baptized within the last year. The Church owns over 100 meetinghouses, with 72 sites selected for possible construction. The Church also operates one school in Uruguay and five in Chile. 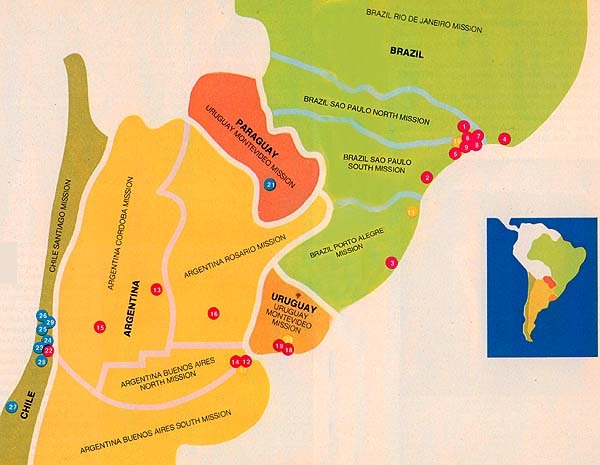 Three Health Services missionaries serve in Brazil, with two others in Uruguay and six in Chile. For these Saints, the area conferences will be a milestone. Like Saints around the world, they will have prepared themselves spiritually and made the necessary financial sacrifices to be in attendance at their conference, to be spiritually nourished by the words of their leaders and the General Authorities, many of whom, including President Spencer W. Kimball, share associations of long standing with South American members. Membership statistics are based on figures as of 1973. Our thanks go to photographers Lamar Berrett, Verden Bettilyon, Tim Boss, LeRoy A. Drechsel, Carl Gibson, Royden J. Glade, Craig Harward, Paul Hayes, Sherman H. Hibbert, Tim Huyck, Warren Luch, Jaime Mella, Bill Nelson, C. Emery Powell, Doug Smith, Manual A. Sueldo, and all the members and missionaries who assisted them.